A professional-grade high-output neck and bridge pickup set with the benefit of hum cancelling. The Seymour Duncan Blackouts 7-string Phase II set features the same amazing 9V active pickup setup as 6-string Blackouts humbuckers. The Duncan AHB-1s Phase I set is a direct retrofit for EMG 707 pickups. Like 6-string Blackouts, Duncan 7-string Blackouts pickups use balanced inputs with a differential preamp for reduced noise. 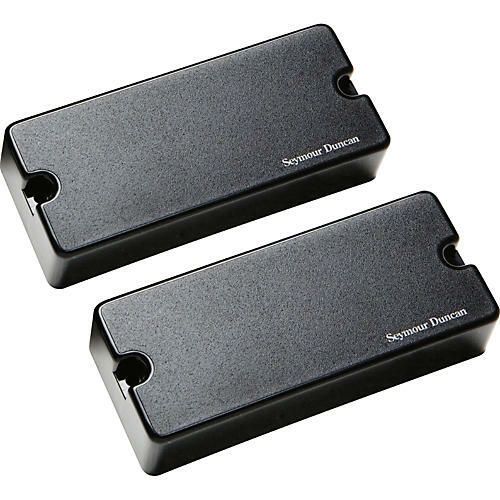 These Seymour Duncan guitar pickups are voiced for heavy rock with greater dynamic range, less scooped mids, and less compression than other active pickups for electric guitars. The 7-string Blackouts are available here as a calibrated neck and bridge set. Seymour Duncan includes 25K pots, stereo jack, battery clip and other mounting hardware. Duncan Blackouts noiseless pickups are perfect for old school metal, garage, punk, thrash, drop tunings, and other heavy rock styles.